I shared earlier how I added meat to my favorite corn casserole and made a dinner out of it. I did it again with Green Bean Casserole. Cook noodles according to directions. Cook hamburger with salt, pepper, and minced onion. Mix green beans, mushroom soup, milk, and mushrooms. Add hamburger and noodles. Bake at 350° for 30 minutes. Top with French Fried Onions and bake for 5 minutes. The casserole tasted great, but it made way too much for three people. 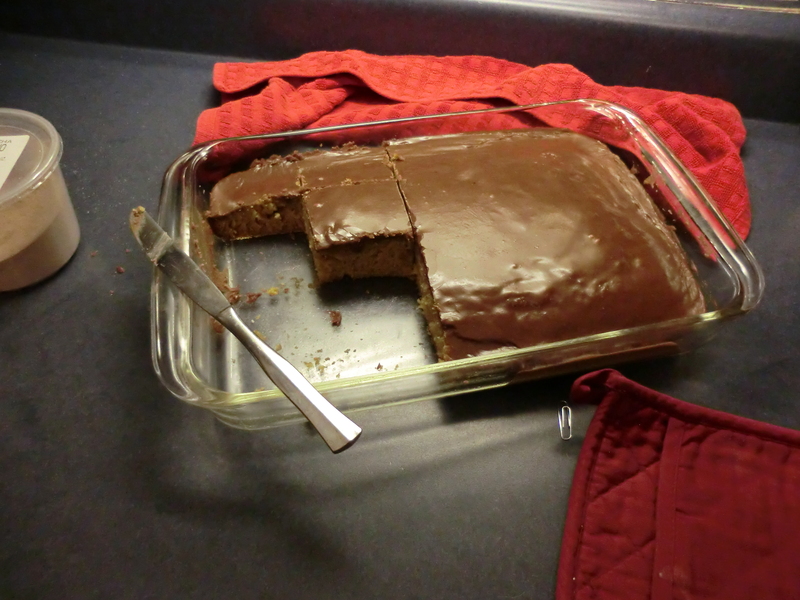 Next time, instead of baking it in a 9″ X 13″ pan, I am going to make it in two smaller pans: 11″ X 17″ and 8″ X 8″. I will use only half of the large can of French Fried Onions, (or one small can), and freeze the second pan after it cools. I can top it with the onions when I warm it up. Any ideas of what I can add to candied yams? My cousin’s wife, Sue, used to bring the best fruit salads to the family reunion…in November! I finally got up the nerve to ask her how she made it. She used frozen fruit. I didn’t want the expense of frozen fruit. I make my fruit salad with whatever fruit is in season. What makes this salad so easy is the juice is already made. The syrup keeps the apples and bananas from turning brown. I made this when we grilled out and used the leftovers for stuffed French Toast. I just put yogurt and fruit salad on it. The Best Leftover Soup Ever! Last week I made a big meatloaf with baked potatoes and corn casserole, see here. I baked enough potatoes for two meals, but somebody didn’t like baked potatoes. The second night I planned on meatloaf sandwiches, and both males rejected that idea. It’s no fun cooking for these two. I ended up with four baked potatoes. I went online and found a recipe for Baked Potato Soup, see here. It was so good! The meatloaf was gone, and the potatoes were used. That left a few servings of the corn casserole. We decided to go to Pizza Ranch for lunch on Friday for the Veteran’s Day half price buffet. After throwing his dog tags on the counter as ID, Mr. Frugalfish loaded up his plate with pizza and chicken. I headed for the salad bar. Their soup of the day was Potato Chowder. I thought, “What if I mixed the leftover corn casserole in with the leftover Baked Potato Soup?” Sunday night I combined them and we each heated up a bowl. We are hitting the busy time of year. Let’s get creative with our leftovers. Note: I never reheat all of the leftovers at once. I reheat one serving at a time. I mixed corn casserole with my baked potato soup. I woke up at 4:15 am and could not get back to sleep. I’ve been fighting an infection for a few weeks and just finished the second round of antibiotics. On Memorial Day, I didn’t lift a finger and just rested up. That meant I needed to do my writing and clean the house before my friends came over on Tuesday evening. I spent the morning writing and then decided to skip cleaning the basement today and pace myself. As he was leaving, college boy said, “By the way, Mom, my new girlfriend will be here for dinner tonight and we will watch a DVD downstairs while your friends are here. 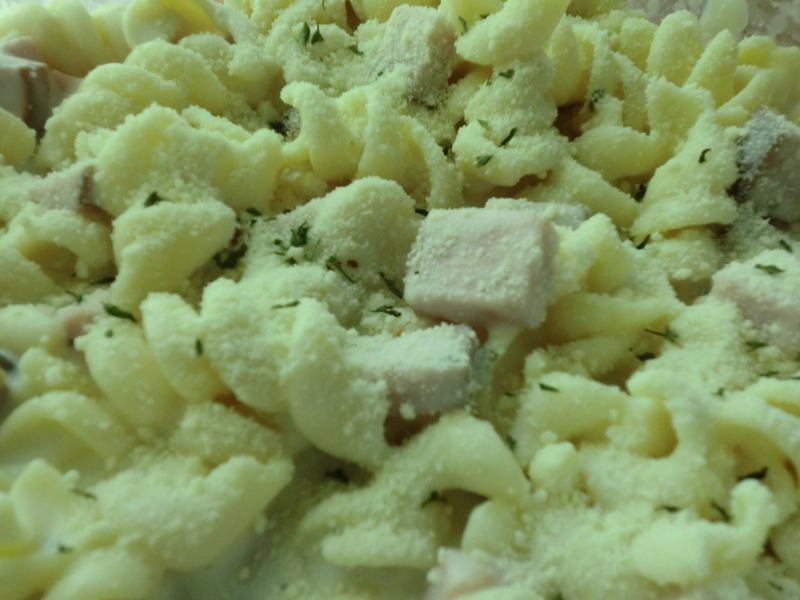 I had thawed out ham and planned on making “Ham with Pasta,” which happens to be one of his favorites. I decided to cut up fruit, candy a bag of baby carrots and rip up lettuce for a green salad. I was finishing up with the vacuum, when he called to say she might beat him here. I started the sauce and made my first mistake. While it was warming up, I set the table, cut up cantaloupe, added fresh blueberries and frozen raspberries to some dessert bowls. I hoped they would thaw before we ate. The dryer stopped. I shut the sauce off, and folded the last load of laundry. Back upstairs, I turned the sauce back on, started water for the pasta, mixed the ingredients to candy the carrots, and ripped up some green leaf lettuce. The sauce would not thicken. My friends would be here in an hour and I turned up the heat. It started to stick and I worried it would scorch. I shut it off and got out the soup bowls. My husband teased me…asking where the croutons were…but besides that, the dish was a success. It had all of the flavor, but was runny. It wasn’t the prettiest dinner I have ever served because the frozen berries stained the cantaloupe. The next time your entrée fails, don’t call for pizza, just call it soup! In medium saucepan, blend cornstarch and milk until smooth; stir in garlic. Over low heat bring just to a boil. Stir in ham, 1/2 the cheese, parsley, and a dash of pepper. Simmer 5 minutes, stirring occasionally. 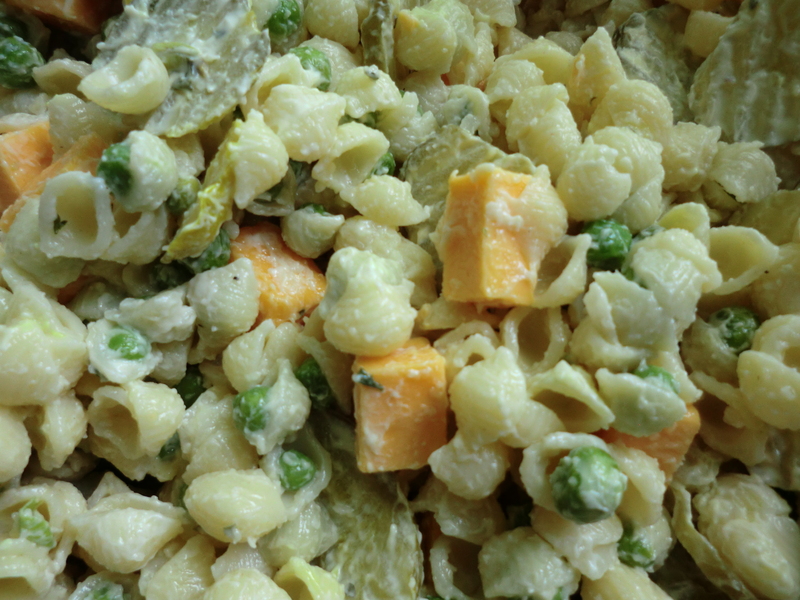 Toss with pasta and sprinkle with remaining cheese. My husband was offered the perfect job! It’s perfect for him, not because there is more money, but he will be doing what he loves! I should be over the moon. But I am going to miss having him around all of the time. Many days, he made breakfast and it was not pouring cereal! He even experimented with new recipes. One recipe I plan to repeat is his Vanilla Pancakes! Mix all ingredients together. 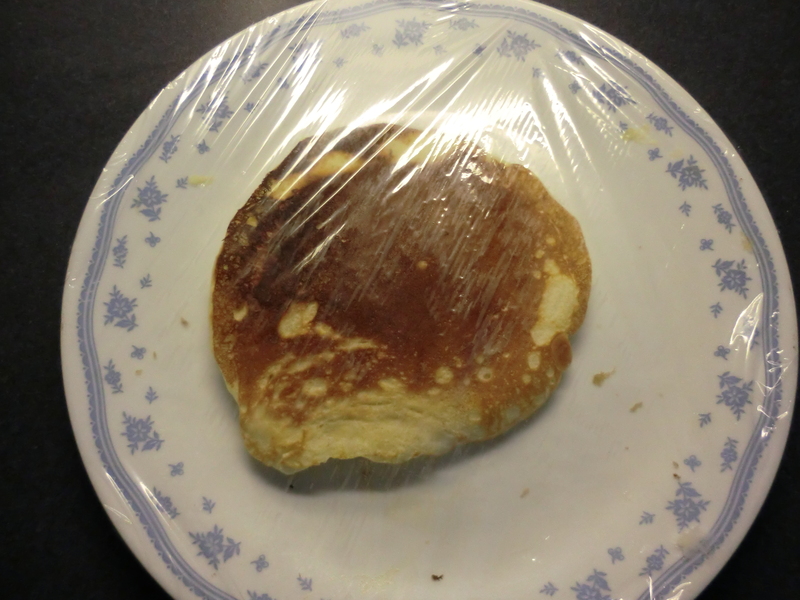 Cook pancakes on griddle until puffed and dry around the edges. Turn and cook other side until golden brown. They are really thick. You can add more milk to thin the batter. Many I talk to agree the quickest way to increase cash flow is to stop eating out. I have found that to be true and I have many posts about different, inexpensive dishes. I like to be creative at breakfast and have shared many different ways to serve Malto Meal. Today I want to share how I made my oatmeal last week. Bring water to a boil. 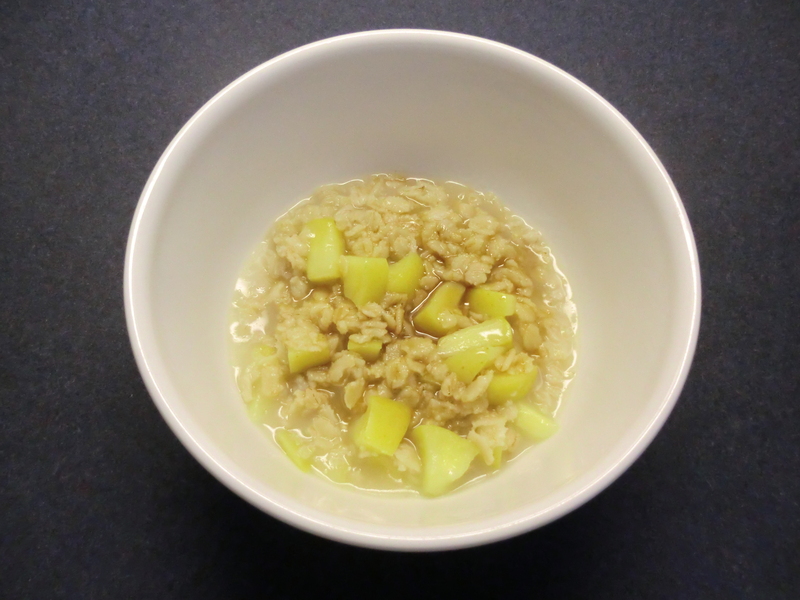 Cook the apple with the oatmeal for five minutes. To serve, sweeten with caramel syrup. Makes 4 servings. I love telling the story of my husband and my sister making chocolate chip cookies. She was spending the weekend with me…and it was rather late…but I didn’t think he could ever top this story. When they made the cookies, they put in two 1/2 cup measuring cups of flour in the batter instead of two and a half cups of flour! Then they wondered why the cookies were running all over my oven! Last week my husband decided to make cookies because we had friends coming over. He had just started when I came in the kitchen and told him I bought the chocolate chip cookies to make fudge for him on Valentine’s Day. He decided to go ahead and make the cookies because one of our friends likes them without chocolate chips. Instead of putting in 2 tablespoons of water…he had added 2 cups! I refuse to waste good food and it looked like cake batter to me. We decided to bake them in a 9″ x 13″ pan. He watched the “cake” closely and removed it from the oven after 25 minutes. I could not believe how good this cake was! We ate two pieces before our friends ever arrived. Each of them ate 2 pieces. Have you ever eaten just one chocolate chip cookie? Well it is the same with this cake. Preheat oven to 375ºF. Combine melted butter, brown sugar, eggs, and hot water; mix well. Stir in remaining dry ingredients. Mix in chocolate chips. Bake 20-25 minutes. Mix granulated sugar and cocoa in saucepan. Stir in butter, milk, corn syrup and salt; heat to boiling, stirring frequently. Boil vigorously, stirring occasionally, 3 minutes; cool. Beat in powdered sugar and vanilla. When he wasn’t looking, I took a picture of the cake. It was great even without the chocolate chips!